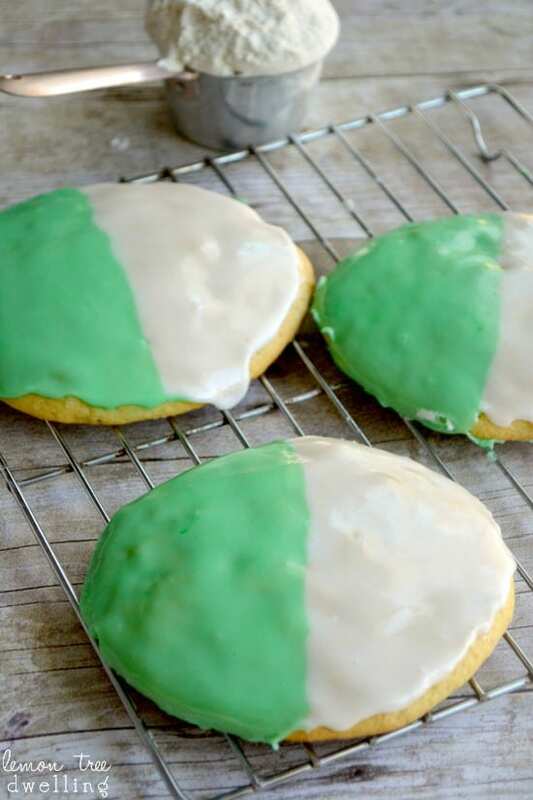 Classic Black & White Cookies with a St. Patty’s Day twist of green! Flavored with fresh lime juice and zest, these soft cookies are just like the original! A delicious treat with a hot chocolate! For much of my life I basically lived in coffee shops. I spent the majority of my free time there…although, by free time, I mean time spent studying, writing papers, preparing lesson plans, and grading assignments….! I’m pretty sure it started in college, when I quickly realized I was NOT a library person and had to find an alternate place to study. Not only did I love coffee, I loved everything about coffee shops! The sounds, the smells, the people watching…. (the distractions)….and the overall feel of them. Yes, I’m a coffee shop person, through and through. After college I started my first job as a high school English and theology teacher, and once again, found myself frequenting coffee shops. I would often spend all day there, working on lesson plans and grading the endless piles of papers and projects that came my way. I was in WAY over my head as a new teacher (I had never even student taught!) and there was something comforting about doing my work at a coffee shop, with other people, rather than being isolated in my classroom or even my apartment. Jorden and I started dating just a few months into my first year as a new teacher, and almost certainly found the amount of time I spent at coffee shops CRAZY!! He has never been a coffee person at all, let alone a coffee shop person…! (He was one of those library people, and could never understand how I could get anything done with so many distractions around me!) Not only was he baffled by my ability to work through distractions, he was horribly bothered by one thing in particular: the SMELL! Whereas I loved the smell of coffee and the fact that it permeated my clothing and followed me home….he did not care for it in the least! But there was one thing he did like about my obsession with coffee shops….and that was the chance that I might bring him a black & white cookie! As an avid Seinfeld fan, he has a special affinity for black & white cookies, and every now and then he would get lucky…! Well, now that we have 3 kids and I’m a stay at home mom, I rarely visit coffee shops (or leave my house at all, but that’s another story!) So it’s been a while since Jorden has enjoyed one of these treats. 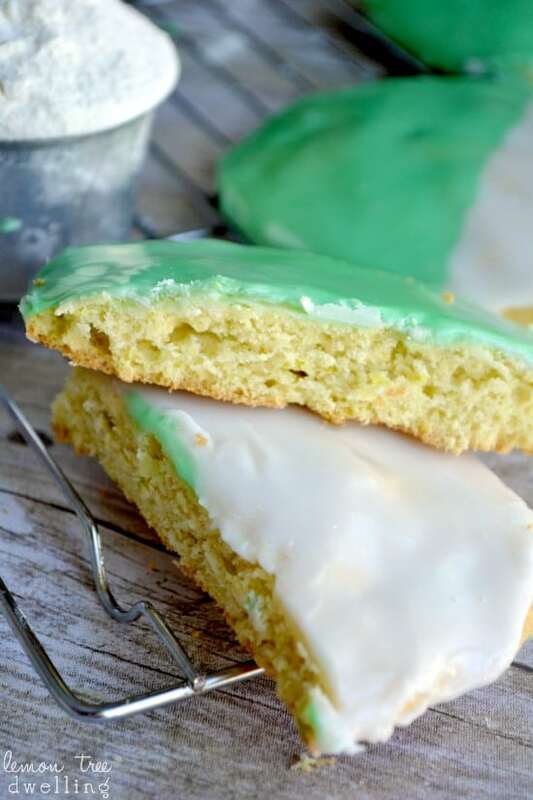 What better time to “get lucky” with a black & white cookie (with a twist) than St. Patrick’s Day? Of course, I didn’t really know where to start with the recipe…..so I took a look at a few different recipes and descriptions online. I learned a few important things about classic black & white cookies: they are more cake-like than cookie-like (who knew!?) and the frosting is not really meant to harden completely on top. (Turns out the black & white cookies Jorden was enjoying from the coffee shop weren’t actually the “real deal”!) I also learned that you are supposed to frost the bottoms and not the tops of the cookies….although I decided to stick with the tops. And, of course, classic black & white cookies are chocolate and vanilla….whereas mine are flavored with lime juice. 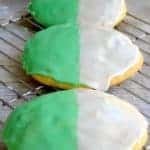 But overall, these green & white cookies are a fairly authentic nod to the original, based on this recipe, and they are delicious. Lucky you!! In small bowl or cup, mix together milk and juice of 2 limes. Beat butter and white sugar together in a large mixing bowl with an electric mixer for about 3 minutes or until it's evenly distributed. Add egg to butter and sugar mixture and beat until blended. Gradually add flour mixture and milk mixture alternately and mix until smooth. Spoon batter in 1/4 cup size servings onto a baking sheet lined with parchment paper. Makes 6 giant cookies. Bake on middle rack at 350 degrees for about 15-17 minutes. Combine powdered sugar, corn syrup, water, and vanilla in small bowl and mix until smooth. Add lime juice and green food coloring to half of icing. 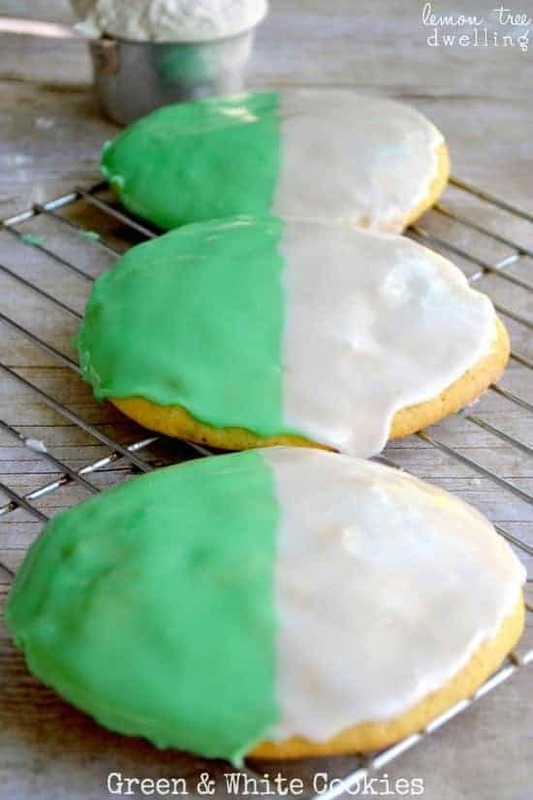 Frost cookies using half green, half white. Allow frosting to set before storing; store in airtight container between layers of wax paper. I love coffee and coffee shops too! Everything about them including the delicious treats. 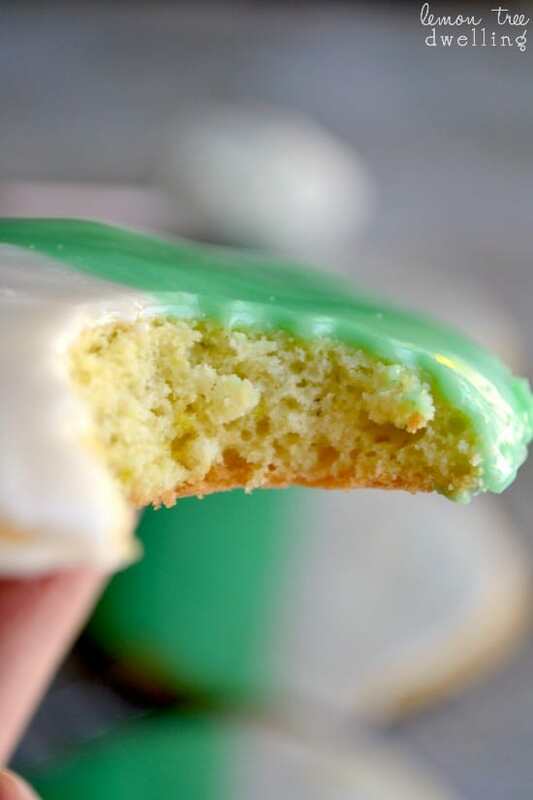 One thing is for sure, I would frequent any coffee shop that served these yummy green and white cookies. I am loving all the line that you’re using and recipes these days and what could be more perfect for St Patty’s day? I LOVE Seinfeld, and the minute I saw the picture of these Green and White Cookies, I instantly remembered that episode – before I even saw your story about it! “If somehow we could just look to the cookie, all of our problems would be solved!” 🙂 Classic episode!! I’m loving the lime you’re doing – so fresh and light! Great recipe – can’t wait to make some of my own! 🙂 Hmmm … I bet the corn syrup keeps the icing from hardening … good idea! I love your creative ideas. 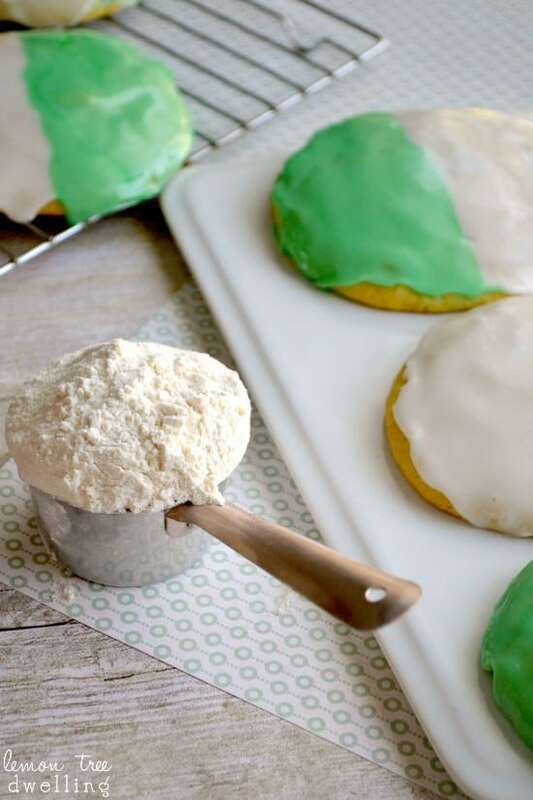 These cookies are really cute and perfect for St. Patrick’s day. Ok how on earth did you become a teacher without student teaching? I thought that was mandatory! 🙂 These cookies look amazing and MASSIVE which is always good in a cookie! What a fun way to decorate cookies! They look delicious! I love sugar cookies! This looks so yummy! Thanks for sharing!